One of the creators of Broadway musical Waitress had said it is "absolutely" a tribute to the late writer-director of the 2007 film that inspired it. "We all really wanted to preserve her legacy and her vision," said singer-songwriter Sara Bareilles ahead of the show's 2019 London debut. Adrienne Shelly was found dead in her Manhattan apartment in November 2006, shortly before her film premiered. A construction worker later pleaded guilty to her manslaughter. Waitress, which had its premiere at the 2007 Sundance Film Festival, tells of a small-town pie-maker who dreams of escaping a loveless marriage. A musical version, for which Bareilles wrote the music and lyrics, opened on Broadway in April 2016. 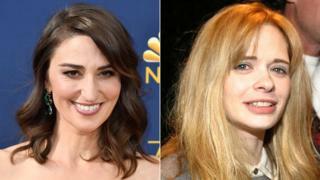 Bareilles, best known for such tracks as Love Song and Brave, said she "did a lot of talking to Adrienne" while writing the musical's score. "We really wanted to honour the essence of what she made and make her presence and contribution known," she continued. Waitress made Broadway history by having four women - Bareilles, book writer Jessie Nelson, choreographer Lorin Latarro and director Diane Paulus - in its four main creative roles. Bareilles also stepped in to play lead character Jenna on two occasions during the show's US run, now in its third year at New York's Brooks Atkinson Theatre. The 38-year-old continued her association with musical theatre by appearing in a live TV staging of Jesus Christ Superstar and co-hosting this year's Tony Awards with Josh Groban. "Both Josh and I have had our lives changed by our theatre experiences so it felt like a beautiful way to say thank you to the community," said the Grammy-nominated artist. "There is an incredible sense of community in the theatre - a a sense of being part of something that is bigger than any one show or any one performance." Speaking at a launch event for Waitress in central London, Bareilles said it was the eccentricity and "messiness" of Shelly's romantic comedy that had initially spoken to her. "I loved that it was a story about good people who make mistakes and are doing the best they can," she told the BBC on Tuesday. Shelly, whose real name was Adrienne Levine, was known for her acting roles in the Hal Hartley films The Unbelievable Truth and Trust. After her death her husband, Andrew Ostroy, set up a foundation in her name to provide grants and scholarships to young female film-makers. Bareilles went on to say she would readily encourage her fellow singer-songwriters to undertake the discipline of writing a stage musical. "I always tell my artist friends it's been the greatest love of my life," she said. "I had no idea how much I would fall head over heels in love with this project. "I got great advice when I started out from a friend of mine, who said I shouldn't be precious with my ideas but share them early and often. "It's easy as a songwriter to keep things private until they're totally complete, but with something like this it's all about communication." Casting has yet to be announced for the London production of Waitress, which begins previewing at the Adelphi Theatre on 8 February.